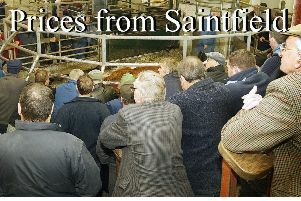 Shows are back to normal, with prices having more spring in their step, with lightweights selling to £2.50 per kilo. Loane Partners, Kesh 460k, £1,080; 420k, £1,020; 390k, £945; 365k, £845, R Harpur, Castlederg 480k, £1,050, M McDermott, Dunmoyle 490k, £1,060; 530k, £1,140; 595k, £1,245, S McAleer, Dromore 435k, £930, B and J O’Kane, Drumquin 370k, £890; 380k, £850, M Donnelly, Creggan 460k, £970, C O’Hagan, Eskra 580k, £1,270, G N Armstrong, Lack 500k, £1,085; 510k, £1,060; 580k, £1,170, Peter Fox, Carrickmore 515k, £1,095, K Doherty Strabane 605k, £1,285, M Coyle, Carrickmore 600k, £1,270, O Harpur, Castlederg 510k, £1,055, H P McMahan, Beragh 605k, £1,240; 550k, £1,120; 720k, £1,445, D McKinney, Fintona 595k, £1,215; 600k, £1,190, S Hilliard Trillick 600k, £1,230, I Clements, Gortaclare 600k, £1,215, P Mullan, Tattyreagh 530k, £1,075; 480k, £950, T Young, Killen 620k, £1,240; 580k, £1,150 and B Gillen, Broughderg 310k, £705; 370k, £760; 270k, £650. Eric Black, Cookstown 405k, £1,055 (260p); 445k, £1,000, Ivan Fraser, Omagh 450k, £1,130 (250p), Noel Quinn, Ballygawley 435k, £1,000; 410k, £900; 525k, £1,080, G Donnelly, Dromore 460k, £1,045, D Hetherington, Omagh 510k, £1,100; 515k, £1,080, C Starrs, Fintona 550k, £1,165; 520k, £1,070, R Donnelly, Dromore 525k, £1,105; 555k, £1,125; 495k, £1,000, Jack Kerr, Omagh 615k, £1,285; 545k, £1,120; 620k, £1,270; 610k, £1,220, W Doherty, Strabane 570k, £1,190; 615k, £1,245, D McKinney, Fintona 580k, £1,195, D McFarland, Sixmilecross 560k, £1,150; 595k, £1,200, J Sayers, Donemana 510k, £1,035; 570k, £1,155; 540k, £1,090, K Doherty, Strabane 715k, £1,440, C Gibson, Eglington 545k, £1,095, G N Armstrong, Lack 565k, £1,130, B and J O’Kane, Drumquin 365k, £855; 380k, £855, B Gillen, Broughderg 305k, £670; 265k, £640, M McKinley, Omagh 355k, £710, J Curran, Dromore 455k, £945, M Donnelly, Creggan 440k, £910, P T McMenamin, Leglands 455k, £940, Stewartstown producer, 465k, £955; 455k, £910 and S McNulty, Glenmornan 500k, £1,010. A Vance, Trillick 540k, £182, P Loughran, Tattysallagh 580k, £182; 540k, £168; 640k, £158, C Monteith, Seskinore 530k, £168, F McAleer, Plumbridge 570k, £166, S Houston, Douglas Bridge 930k, £162, William Gamble, Donemana 690k, £161; 740k, £159, A Donaghy, Loughmacrory 610k, £147 and K Walsh, Waterside 770k, £144; 720k, £140. R Smyth, Drumquin 590k, £147, M Davis, Dromore 750k, £108, S McSorley, Beragh 740k, £103 and R McElduff, Carrickmore 600k, £102. K McGrade, Dromore £2,480 and £2,020 calved cows; £1,620 and £1,600 in-calf cows; £560, £510 and £500 weanling Friesian heifers. R Smyth, Drumquin £480 and £460 Belgian Blue bulls; £420 Belgian Blue heifer, B McBride, Trillick £440 Belgian Blue bull, D McConnell, Knockmoyle £390 Belgian Blue bull, P Ward, Douglas Bridge £385 and £380 Aberdeen Angus bulls, K Johnston, Kesh £360 Simmental bull, T O’Kane, Leglands £355 Belgian Blue bull; £340 Simmental Bull, S McFarland, Sion Mills £355 Belgian Blue bull, D McNamee, Newtownstewart £340 Limousin heifer, G Henderson, Irvinestown £335 Simmental bull; £295 Simmental heifer and S Grimes, Beragh £310 Limousin heifer. F Donnelly, Trillick £700 Charolais bull, M. Johnston, Lack £690 Limousin bull, N. McCullough, Cookstown £650 and £615 Hereford bulls; £550 Hereford heifer. Boa Island Farms £605 Limousin heifer.